Below are two articles that we have written about gingers. However, few months ago, we discovered even more beneficial information about ginger's health benefits through century old Chinese medical records. Also, we realized that our old knowledge and discoveries have to be rewritten to support these new findings. When I visited a Chinese traditional drugstore, a Chinese owner who is an herbalist came to talk to me since he noticed that I am the founder of the PYRO-ENERGEN. We discussed about several botanical herbs and their effectiveness until the topic came to ginger treatment. Slice the fresh ginger, making slices of about 1/8-inch thick. Try to make the pieces the same in size so that it will dry uniformly. Place about 90 grams of sliced gingers for 10–12 minutes to a standard 600W microwave oven. 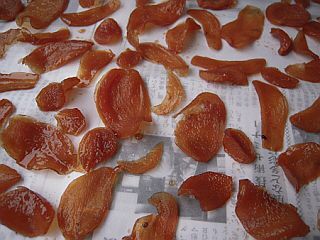 Some information states that an important active component of ginger called "shogaol", is produced more when ginger is dried. Drying the ginger under the sun during a hot summer may take one day or two. Drying it in a cool shade with good breeze may take more than one week or more. We do not recommend drying it during rainy season to avoid fungus problems. New findings and recognition of century-old Traditional Chinese medicine made dried ginger a popular product and fashionable from young to old. However, many of us including traditional healers and scientists in today's modern day took the ginger process incorrectly. I tried to read more and dig deeply on various century-old Chinese orthodox medical books. Yes, I found a certain mistake as well as misunderstanding about the uses of ginger. If you can use ginger properly, then it can really keep you healthy, and will probably even heal your sufferings including your empty pocket. It's a common knowledge that ginger helps in relieving cold, and some people have adapted it in a variety of day-to-day cooking—but "with a very wasteful way of cooking and eating", I must say. In fact, to really warm your body, the way it is commonly cooked and eaten was completely different or incorrect according to Chinese medical books. From the people I surveyed, almost all of them believe that fresh ginger in any form of cooking and eating can be good for health and make our body warm and improve blood circulation. Some of our friends who are office workers carry their tea bottles containing ginger extracts. They claim that they drink 5–6 cups in 5–8 hours of time, and it keeps their body warm and healthy the entire day. Some claim that their appetite increased while maintaining fit and slim body. However, our studies show that something is wrong as our scientific records show negative results for many patients. What could that be? Long before our studies, the century-old Chinese medical book stated that the use of fresh ginger is recommended for reduction of fever, while dried ginger is required for keeping our body healthy and warm. Unfortunately, many of us did not understand this simple fact correctly. 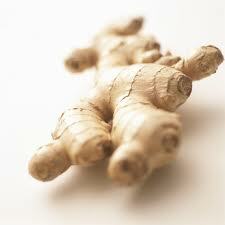 In fact, most traditional healers including pharmaceutical companies around the world have been using fresh ginger. That's what we have discovered. Of course, there are many ways in cooking and eating ginger. Depending on the purpose, you should find what kind of ginger is best to apply. We conducted an experiment on a woman volunteer by having her eat ginger that we prepared. Then, we monitored her body temperature using thermograph as seen below. This thermogram indicates that her body temperature went down one hour after eating fresh ginger. This shows that fresh ginger is good in reducing body temperature. It also shows that fresh ginger is really recommended for reducing high fever. This thermogram indicates that her body temperature went up one hour after eating dried ginger. This shows that dried ginger is good in increasing body temperature. 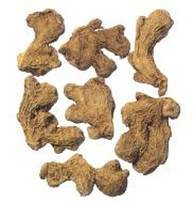 It also shows that dried ginger is good in keeping your body warm especially during cold winter. Of course, whether gingers are fresh or dried, they are not just meant for increasing and reducing body temperature. It also have hundreds of medicinal benefits. In fact, according to our survey among 1,000 cooking students and chefs, none of them had known about the uses of dried and fresh ginger at all. 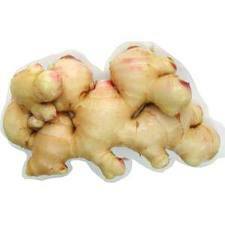 Thus, they have been using any available ginger, thinking that they are all the same and are equally good for health. 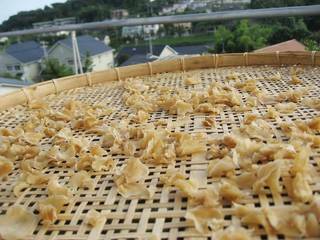 What is the secret of dried ginger? Fresh raw ginger contains the spicy substance called "gingerol". We came to understand that dried ginger has several times more gingerol than fresh ginger. Gingerol helps increase immune cells in the blood vessels to protect the body from bacteria and other toxic elements. Gingerol is also known to protect your body from contracting bacterial bronchitis. However, you should know that gingerol is easily oxidized when grated or cooked. Thus, you must consume grated or cooked ginger immediately. We recommend that you grate or cook ginger just before your meal. Once again, use fresh ginger for reducing your body temperature, and use dried ginger for warming your body temperature. Both gingers are good for your health maintenance and in preventing all kinds of diseases.